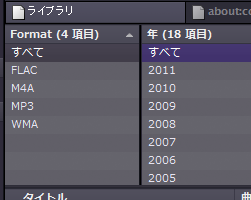 I've updated Format Column extension for Songbird: v0.1.10. Now you can set "Format" for a filter of the filter pane view. Setting up a filter is little bit tricky. You need to do "Tools->Format Column->Set Format Filter" menu command. And then select a position where you want to set the format filter. Please note you cannot set it by the context menu of the filter. I know it should be done by the context menu but, because I'm new to create a Songbird add-on, I don't know how to add entry to the menu. Does anyone know the way? If you know, please teach me!